The Smocking Bird, in Birmingham, Alabama, is the third shop on my trek that specializes in children's clothing, and heirloom sewing. (Previous posts are here and here.) Doesn't this shop-in-a-house look warm and inviting? Well, it is! 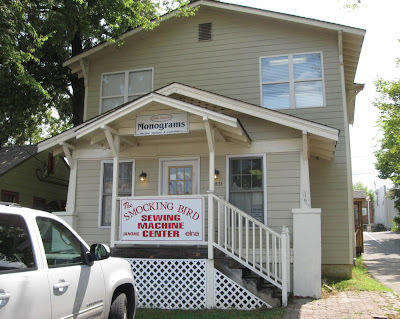 The Smocking Bird, Birmingham, Alabama. Carol, the owner, and her staff are friendly, knowledgeable and totally customer focussed. Whether you walk in the front door or park 'round back and enter through the side door, you are warmly welcomed by the staff and the charming atmosphere. 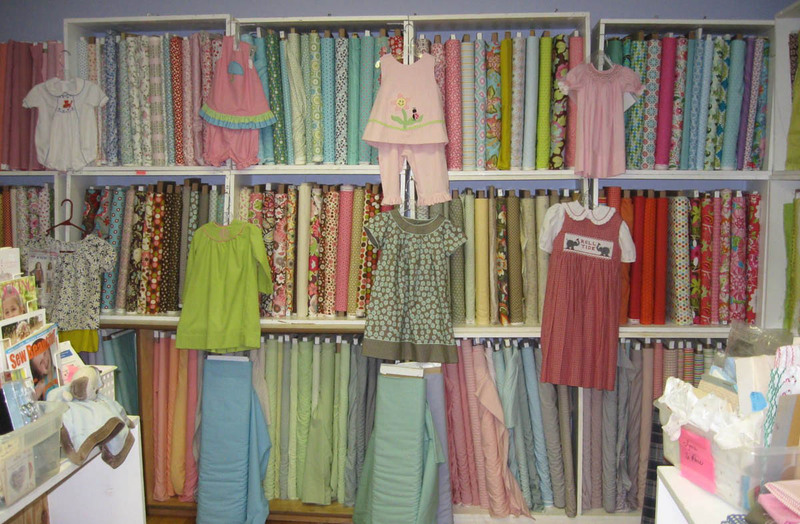 Adorable little jumpers, dresses and childrenswear made of cotton and batiste fabrics in bright, happy colors hang throughout the shop. They are too cute and just make you smile! 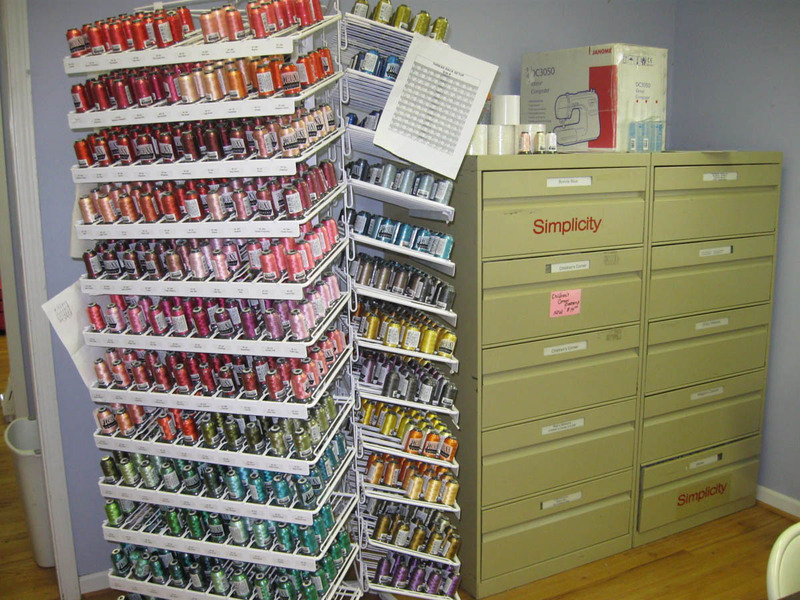 Inspiration through shop samples is everywhere. Outfits for every season and occasion. 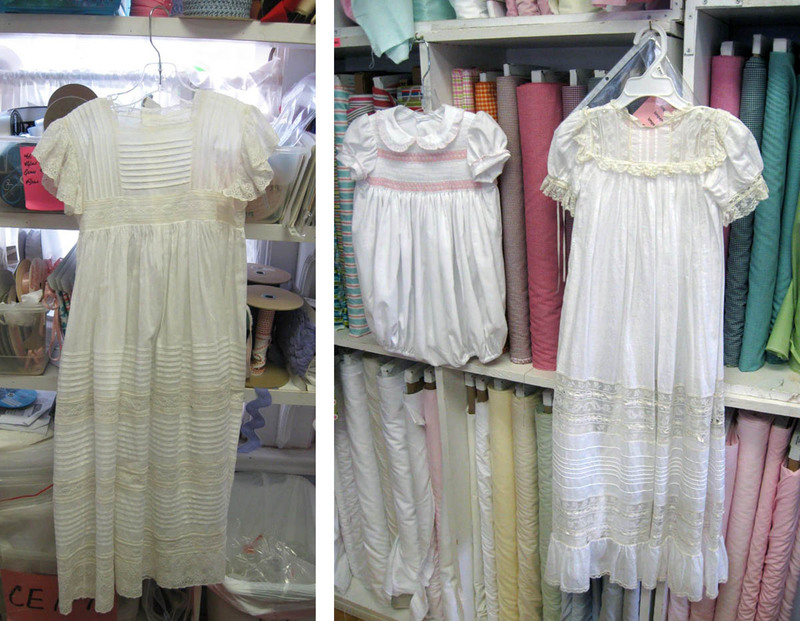 The heirloom sewing pieces—with lace insertions, rows of pin tucks, smocking and delicate ruffles— are gorgeous! Heirloom dresses and baby gowns. There was no lack of notions and embellishments at The Smocking Bird. 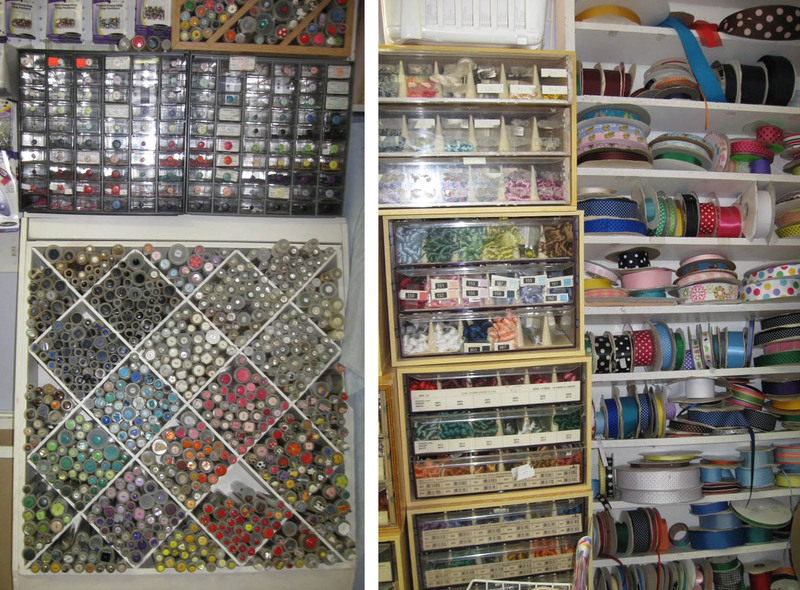 Check out the amazing selection of buttons, ribbons, trims, rick-rack, floss and various smocking accouterments. that add the perfect detail to clothes and accessories. 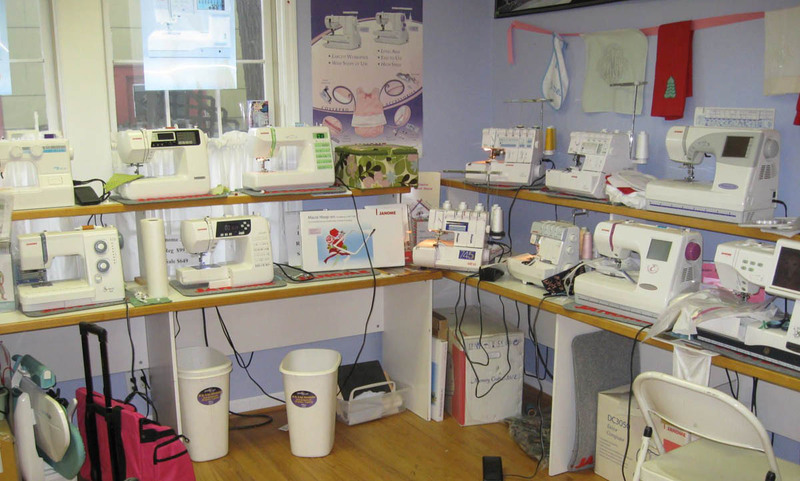 As a Janome sewing machine dealer, The Smocking Bird carries a full line of sewing machines, sergers and all the latest in computerized embroidery machines for every need and skill level. As a machine quilter, the Horizon 7700 caught my eye. A full line of Janome sewing and embroidery machines. 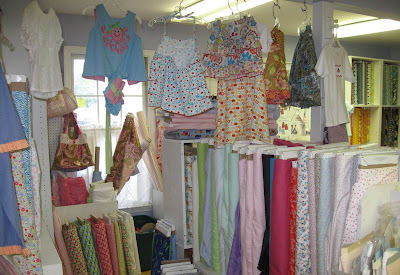 Threads, sewing machine feet and other accessories are available in a large selection. 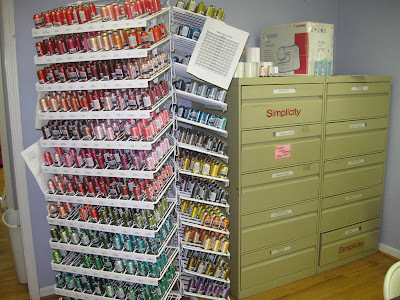 Sewing threads in a full range of colors and fiber types. Here is more embroidery threads and a cabinet full of sewing patterns. 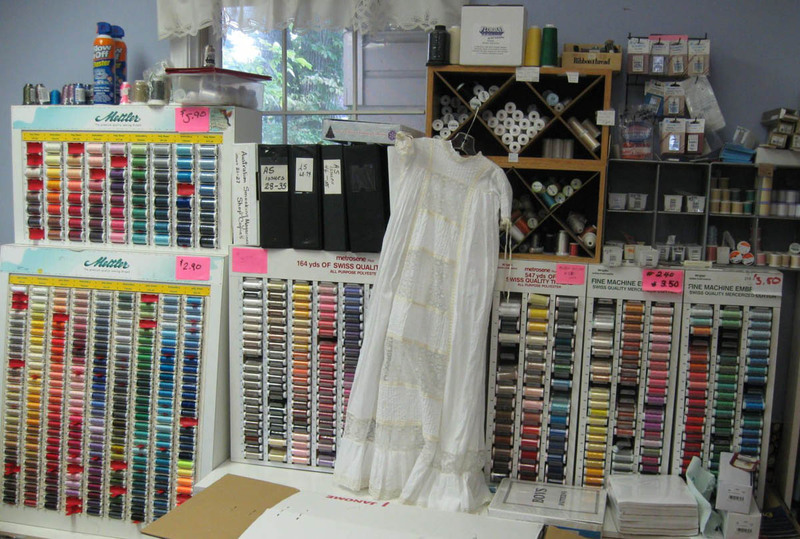 Embroidery threads and an extensive selection of patterns. 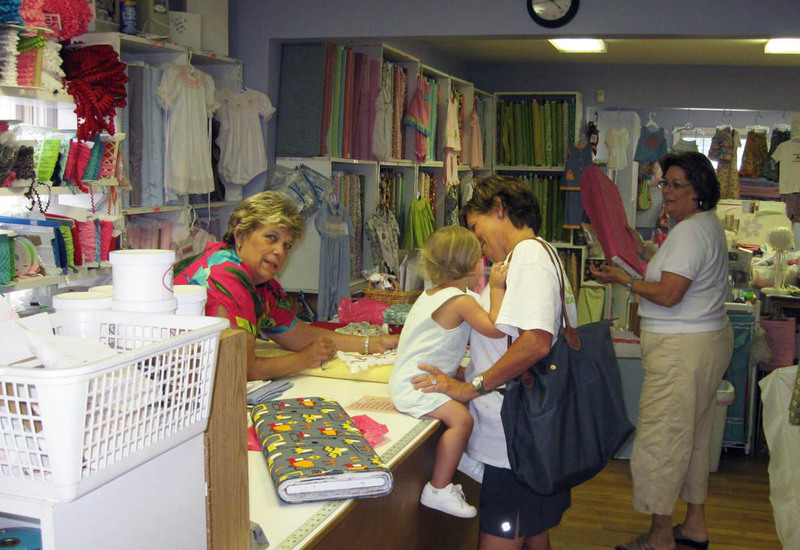 Carol has been in business for over 27 years and in the current location about 8 years. The second floor was added to this house to make more room for their sewing machines, smocking and sewing supplies on the main floor and to accommodate two classrooms and an office upstairs. Carol and I had a delightful conversation in one of the bright upstairs classrooms about free-motion quilting on Janome sewing machines, flannel fabrics for baby quilts, and the Birmingham Barons (the minor league baseball team for the Chicago White Sox) who play in the southern league with the Chattanooga Lookouts. Carol (left) is cutting fabric and assisting a customer with selecting buttons for her project. 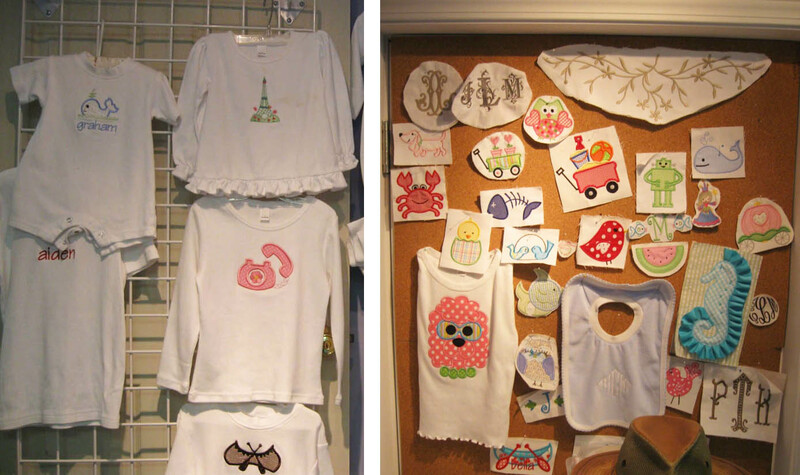 A custom embroidery business rents the back room and offers embroidery and monograming on tops, T-shirts, rompers, bibs and other children's clothing. During my visit, I was delighted to hear the chatter of young voices coming from the classroom. A group of girls were in a summer sewing class. 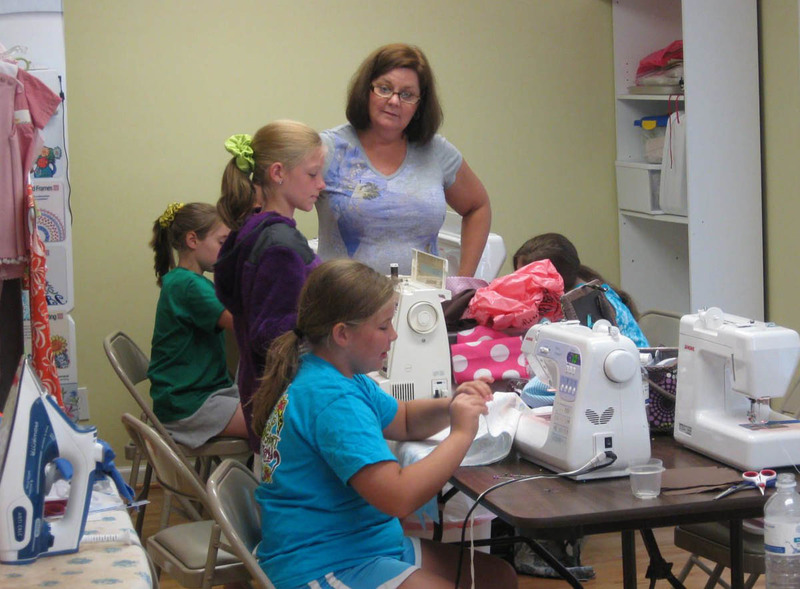 You can't start too early or be too young to learn to sew! These young ladies were having a lot of fun while learning a new, creative and useful skill that will last their lifetime. A group of young girls leaning to sew in the classroom at The Smocking Bird.